How to build a WPF application with VC# code to control its behavior in Visual Studio 2017? 1. 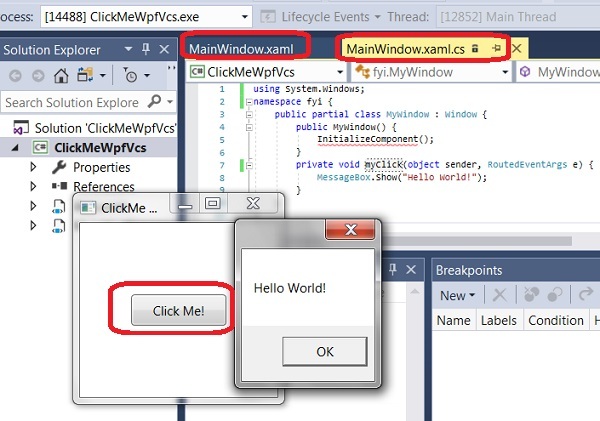 Create a "WPF App (.NET Framework) project as shown in the previous tutorial. 3. Click "OK". You see a default application window displayed on the visual design section showing up. 9. Click "Build > Build Solution" menu. The application should be compiled with no error. 10. Click "Debug > Start Debugging" menu. Your application will run. 11. Click the "Click Me!" button, the message is displayed.